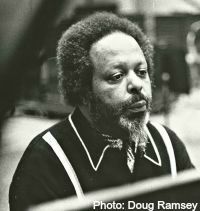 I was privileged to be in the studio for the recording of Musique du bois, invited by producer Don Schlitten to write notes for the album. The notes were comprehensive, but when 32 Records reissued the music on a CD in 1997, the notes were gutted. Among the many sections left on the cutting room floor was the one that described the making of “Willow Weep For Me.” Therefore, as a public service in memory of a great day in RCA’s Studio B in Manhattan, here is that part of the story. 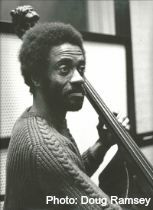 Woods’ head arrangement of “Willow Weep For Me” begins with the rhythm section playing the introductory pattern used by Miles Davis for “All Blues.” The plan is to continue the figure through the alto solo, but Woods finds it too monotonous. Take one is cut short. 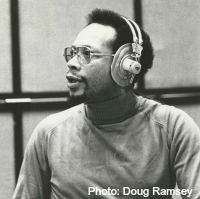 There are superior solos on take two from Woods, Byard and Davis, but the leader is interested in supplemental harmonic ideas and goes to the piano to suggest some chords. The third take opens faster, with Davis adding vibrato and Dawson slapping the brushes on his snare drum just enough to impart a happy dance feeling. Woods responds with a sunny solo that is in sharp contrast to the rather brooding statement of the previous take. He introduces a phrase from “Drum Boogie,” chromaticizing it outrageously. Davis solos with an abandon that causes a sharp collective intake of breath in the control room. Byard has a brilliant solo full of Tatum fragments, and the piano sweeps under Woods as he re-enters for a final chorus packed with modulations, piping high notes and gut-rumbling low tones. “Perhaps you’d prefer avacado seeds,” suggests an eavesdropper. “Yes, with hot sauce,” Dawson grins, and he goes into a monologue full of such gustatory Slim Gaillardisms as mosquito knees, hippopotamus lips and reety pooties. “Slim who?” some of you may be asking. Well, continuing in the spirit of public service, tomorrow’s Rifftides post will bring you up to date or—more accurately—back to date on Slim Gaillard. As for Musique du bois, the 32 Records CD with truncated liner notes is still available. So too, it turns out, are copies of the LP with the full notes. Go here for information. This is amazing. How fortunate you were to be there, and no doubt your presence was part of the mix that made everything so magical. I recall your original liner notes now, and how terrific they were, even though I lent that LP and lost track of it. (I’ve always been unhappy with the CD release because the sound quality is inferior compared to the original.) If only this quartet made in heaven had recorded 25 or more albums! I would go so far to say that Musique du Bois is close to being the ultimate example of entirely equal interplay between members of a jazz quartet, all truly improvising and playing at a high level of inspiration. 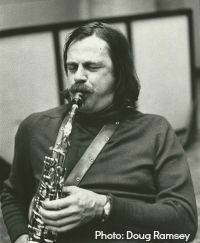 And what can you say about Phil Woods on Musique du Bois, except that he plays like a god in the throes of creation, including taking the alto saxophone to places it’s never been before. All the tracks are immortal, and the ballad performance, “The Summer Knows,” belongs up there with the slow movement of the Moonlight Sonata. Completely agree. Back when this great album was first released I was just beginning to learn about jazz. I knew who Woods and Davis were and bought this album upon seeing it in a record store in downtown Brooklyn. As soon as I played it I knew I’d found a treasure. And those liner notes; was this the same Doug Ramsey I’d seen do the news on WPIX-TV? * Well, all these years later I still have that album and I’m still reading Doug Ramsey. Thanks to you all for enriching my life.